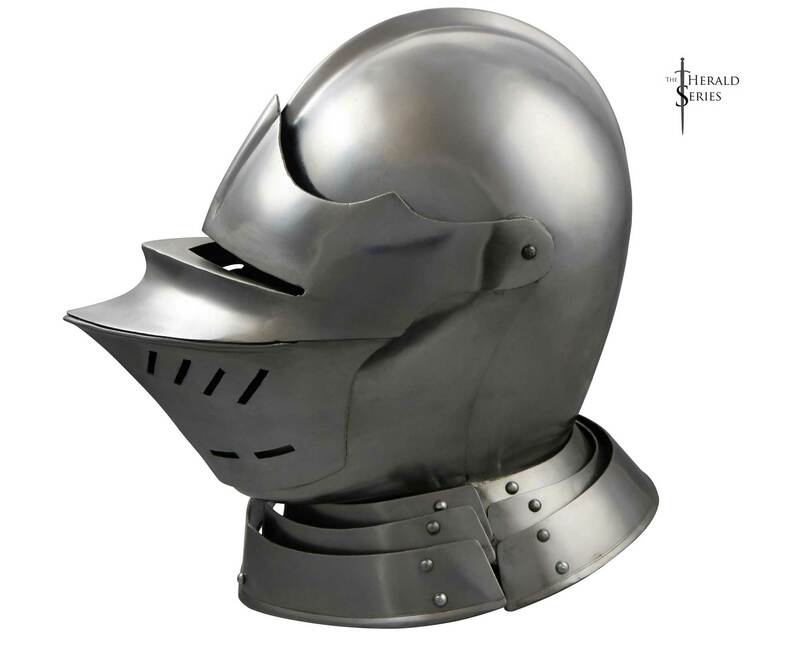 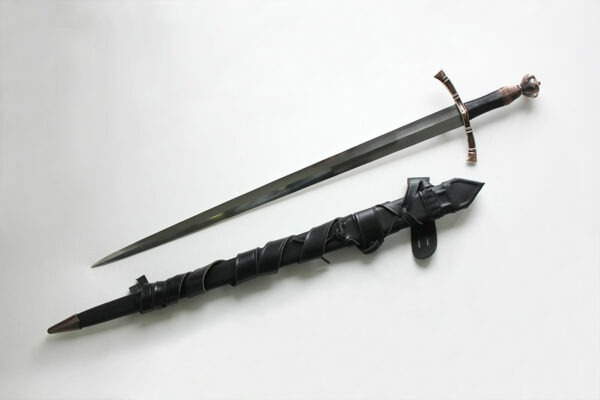 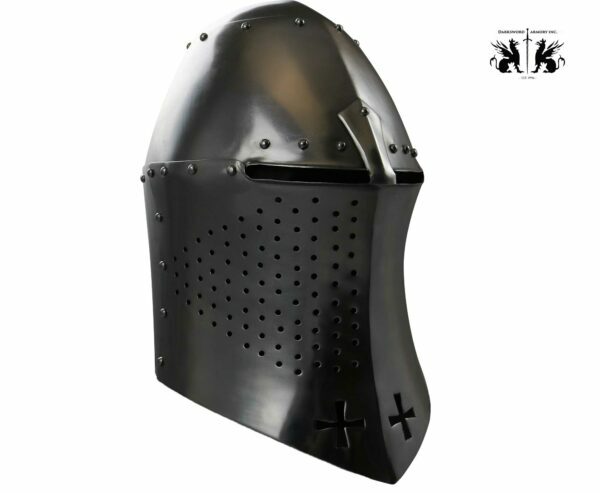 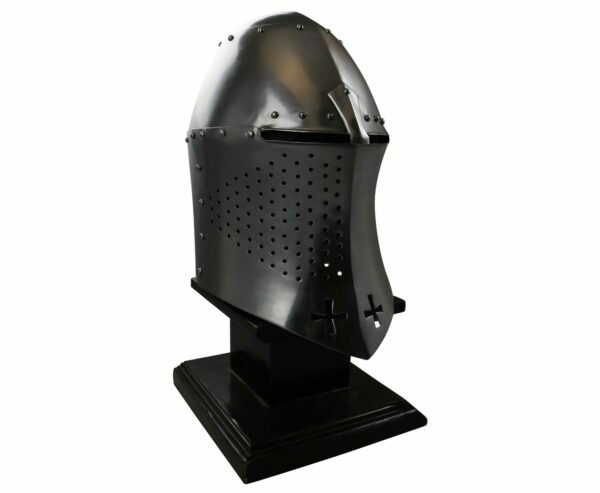 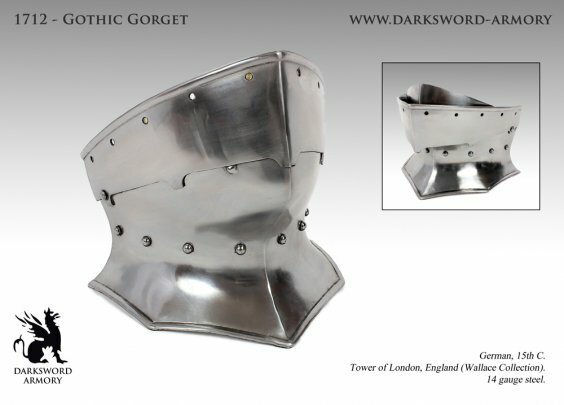 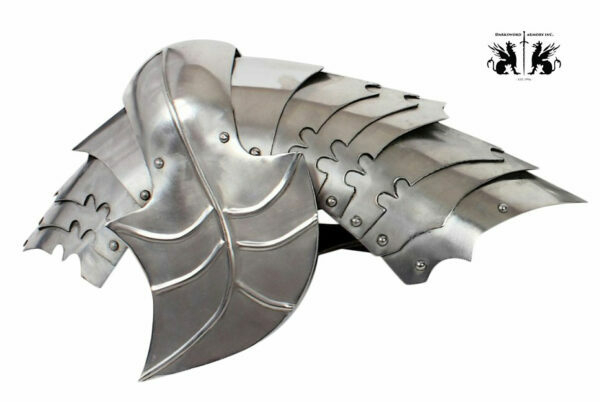 The Herald series Closed helm is an authentic reproduction, made of 16g steel. While not pictures, the visor of this late medieval helmet opens on three levels (the nose, bever and gorget). 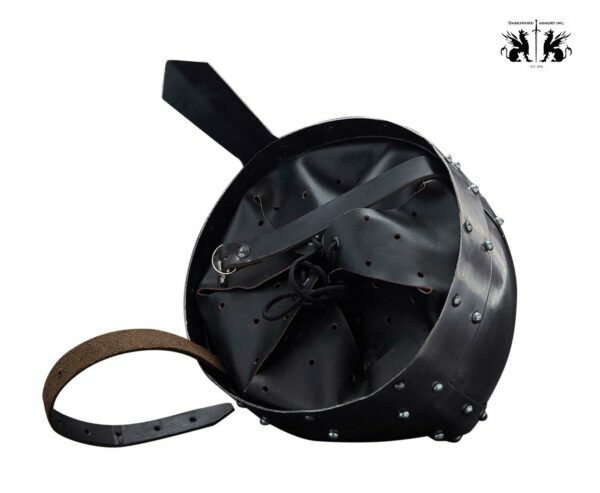 The inner is lined with an adjustable leather liner and strap. 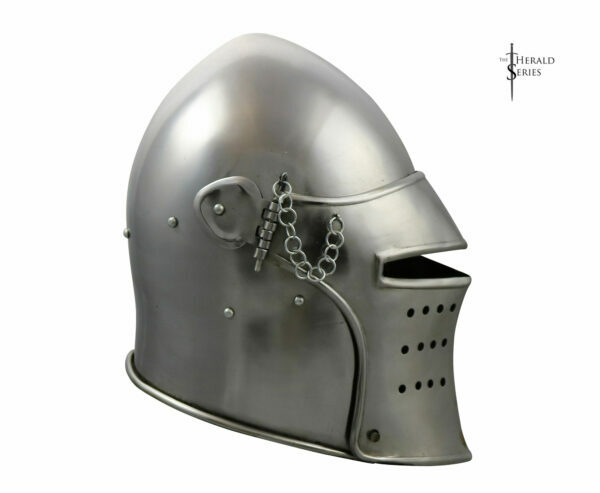 The Closed Helmet was developed in Europe in the mid 15th Century, was based upon late variants of the Sallet, and was most popular in the late 16th and early 17th centuries. 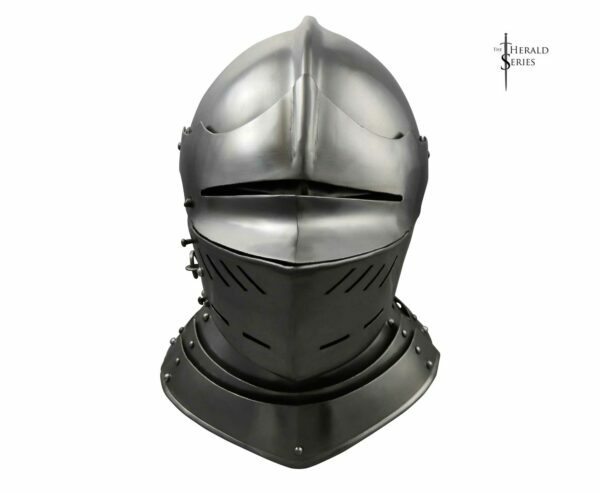 It was a key piece of a suit of plate armor and was formed fitted to the contours of the head, neck and throat to fully enclose the head. 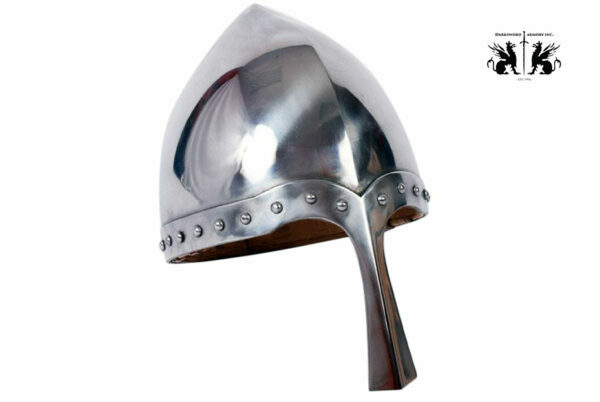 The Closed Helmet is often confused with the Armet. 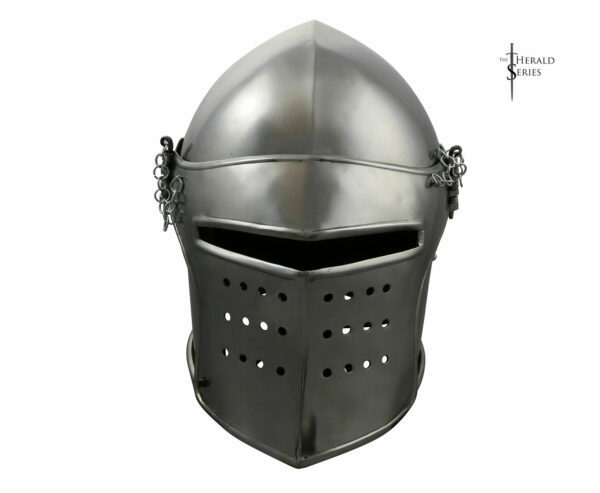 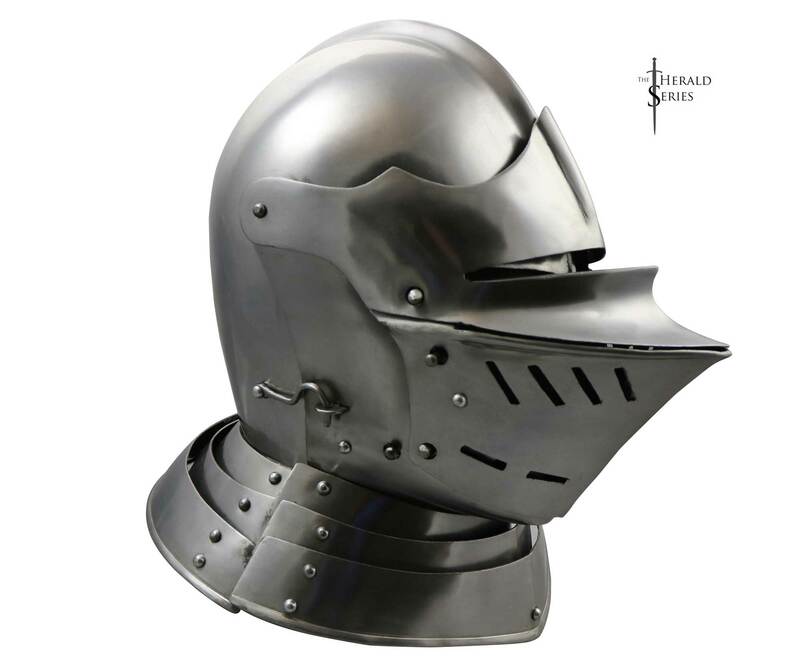 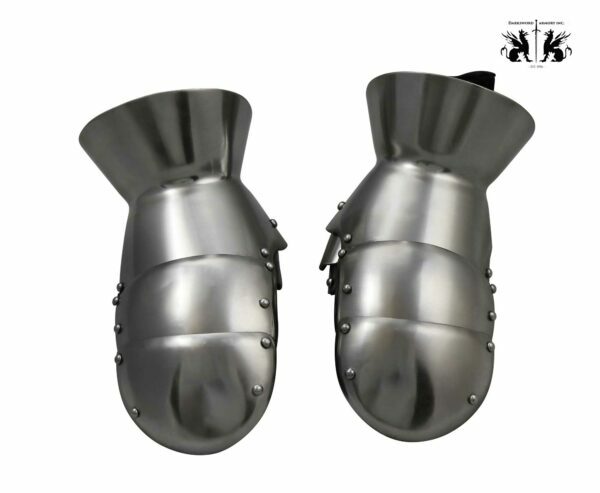 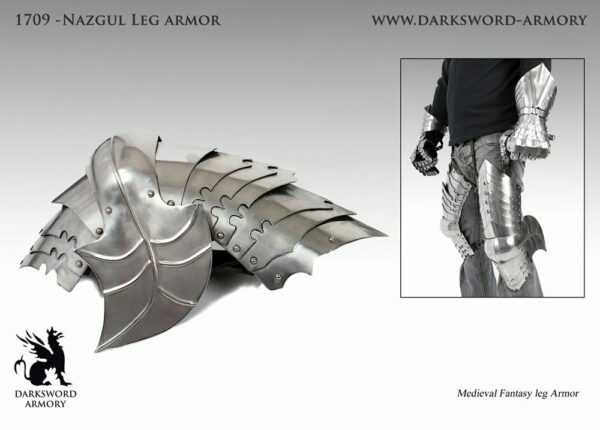 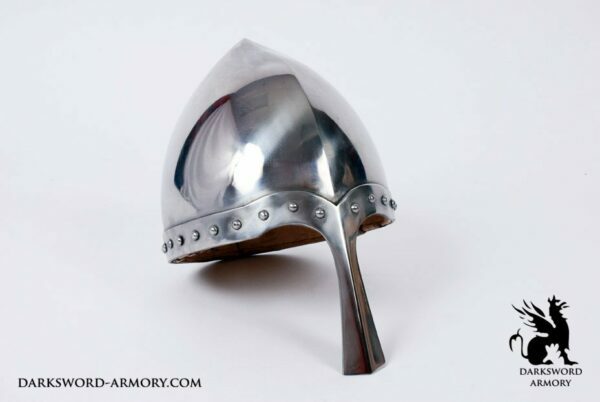 The term “Armet” during contemporary times was used to define any helmet which fully enclosed the head. 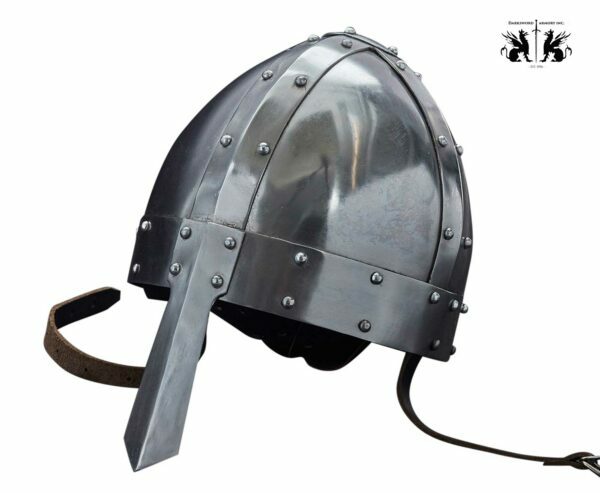 Modern scholars however, have developed a new classification – the Close Helm or Closed Helmet. 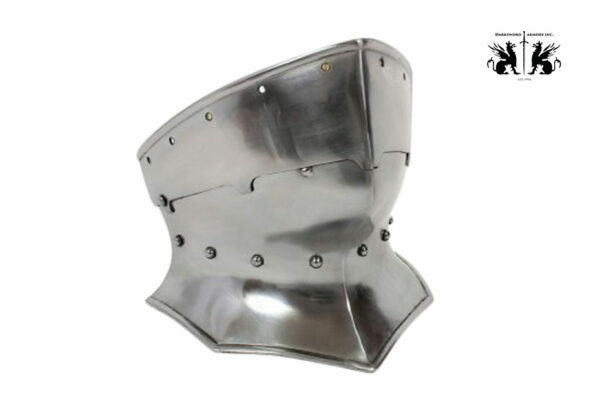 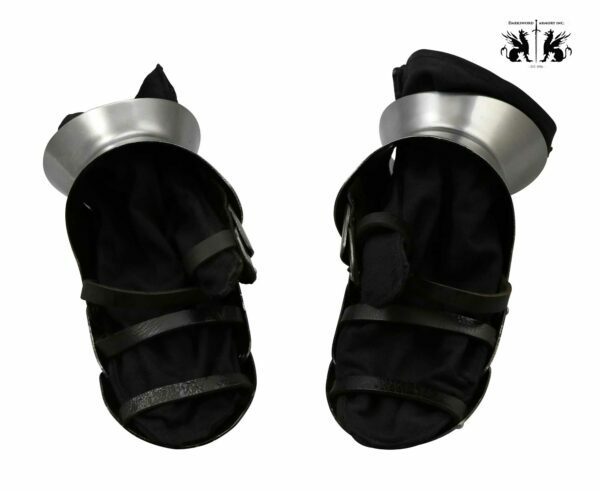 Both are very similar in appearance and period of use, but are distinguished based upon the method by which they could be opened to be worn. 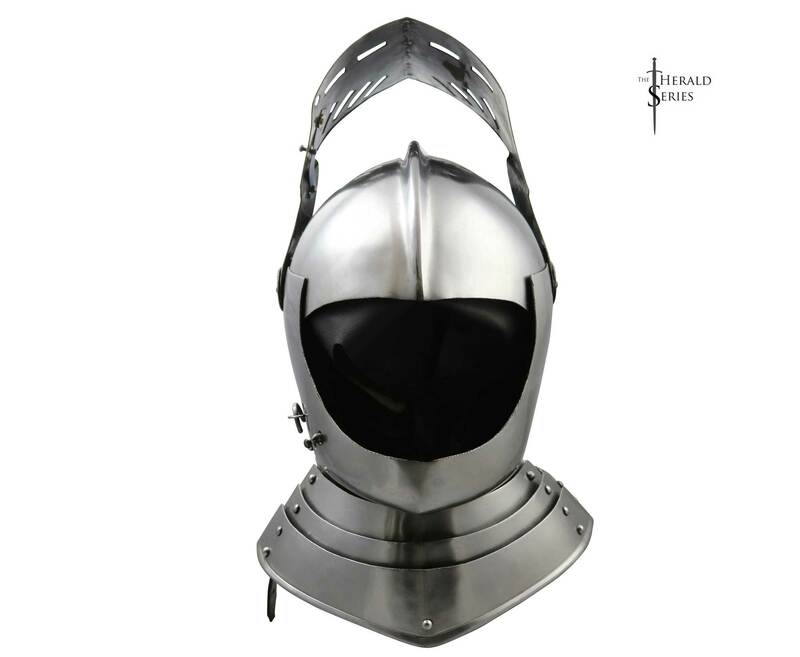 The Armet had hinged cheek plates which opened to allow the helmet to fit over the head; while the Closed Helmet had a moveable bevor (chin and neck guard) that was attached to the same pivot points as the visor and opened vertically to allow the helmet to fit over the head.